Like most regular children in the 2000’s, we were obsessed with Pokémon games and anime series. The experience of exploring new environments, discovering new creatures and collecting them, always fascinated us. Maybe this was a sign of what we would become: zoologists. During college, as we got to know ever more about animal biodiversity, we could not help but notice several similarities between Pokémon and real animals. Today, as an arachnologist and an entomologist, and still Pokémon fans, our interest in arthropods and admiration for this franchise were the main motivations for this study. Animal diversity has always been debated and represented in different types of media. Since the Pleistocene, humans depict animals in their paintings (Aubert et al., 2014), likely reflecting an age-old fascination with nature that still endures. Or, as E. O. Wilson puts it in his “biophilia hypothesis”: “humans have an innate desire to catalog, understand, and spend time with other life-forms” (Wilson, 1984). Given this, studies relating Zoology and culture, especially pop culture, are becoming more and more common recently. Just to name some examples including arthropods, Coelho (2000, 2004) studied insect references in lyrics and cover art of rock music albums, Castanheira et al. (2015) analyzed the representation of arthropods in cinematographic productions, Salvador (2016) studied the biology of giant centipedes in the Gears of War game franchise, and Da-Silva & Campos (2017) analyzed the representation of ants in the Ant-Man movie. There are even some science outreach works about the Pokémon franchise as the analysis of the ichthyological diversity in the Pokémon world (Mendes et al., 2017) and the study of the group of birds popularly called “robins” represented in the game (Tomotani, 2014). Arthropods correspond to the largest part of the known biotic diversity in the world, counting with over 80% of animal diversity (Zhang, 2011a). With lots of morphological variation, the phylum Arthropoda is divided into five subphyla: Trilobitomorpha (the trilobites, now extinct); Chelicerata (arachnids, horseshoe crabs, and others); Crustacea (shrimps, lobsters, crabs, barnacles and woodlice); Hexapoda (insects) and Myriapoda (centipedes and millipedes). With a high biomass, terrestrial arthropods can be easily seen in a variety of environments, and their presence affects us in several ways. Although arthropods can inspire fear as venomous creatures or disease vectors, actually most of them are either harmless or important for our own well-being and survival. For instance, many groups of insects are extremely important pollinators and without them, agriculture would collapse. Moreover, terrestrial arthropods have a considerable role as bioindicators for assessing environmental quality (Andersen, 1990; Brown, 1997; Fischer, 2000; Ferrier et al., 2004) and some even have remarkable medicinal uses (Kumar et al., 2015). The word “Pokémon” is a contraction from the Japanese “Pocket Monsters” (ポケモン). The idea consists in fictional creatures – the eponymous Pokémon – that humans can capture and train to do all sorts of chores, the main one of which is fighting each other. Created by Satoshi Tajiri, Pokémon was originally a game released in 1996, but its tremendous success soon spawned an anime series, mangas, animated movies, a card game, and countless ”goodies” (toys, accessories, clothing, candies, etc.). Developed by Game Freak and published by Nintendo, today Pokémon is one of the most successful game franchises in history, with more than 270 million of overall game copies sold around the world (The Pokémon Company, 2017). The anime series was released in 1997 and was an instant success with kids, remaining so to this day. Many episodes have an environmental tone, showing how humans can affect the habitats and biodiversity of Pokémon, and emphasizing the importance of collecting for species preservation (Bainbridge, 2013). As a game franchise, Pokémon reached mainly teenagers, which remains a loyal customer base to this day. Today, the games are in their seventh generation (“Gen VII”) and each generation adds a new territory to be explored and several new creatures to be caught. As of now, there are 802 creatures, but some new ones have already been announced for the second game of Gen VII. The creator of Pokémon, Satoshi Tajiri, loved to collect bugs when he was young, which likely influenced his creation. The Pokémon are mostly inspired by animals and plants and some of them have particular features that can be related to certain real species. In this way, Pokémon biodiversity can be seen as a virtual sample of natural biodiversity. The main objective of this study is to survey all Pokémon inspired by arthropods, up to Gen VII, and conduct a comparative biological classification of them until the taxonomic level of “Order”, if possible. Considering the Pokémon world as a simulation of our own natural world, we also investigate if the different arthropod groups have the same real-world representativeness in Pokémon. This can be done by analyzing the proportion of species of each group. The sources of information used for this study are: Bulbapedia (https://bulbapedia. bulbagarden.net) and The Official Pokémon Website (https://www.pokemon.com). The Pokémon were classified by Type, Generation, and by their respective taxonomic levels in real-world Biology: Phylum, Subphylum, Class and Order. The classification into real-world taxonomic levels was made by analyzing morphological and behavioral characters present in the Pokémon species, and comparing them to the relevant animal groups (Fig. 1). Morphological characters were obtained by observing official illustrations and game models. Behavioral characters were obtained from the Pokédex entries of each Pokémon species. Some Pokémon species presented arthropod’s features that were too imprecise to be related to a certain subphyla or order, or their design included features from more than one group of arthropods (for instance, Venonat and Whirlipede). In these cases, the species were marked as “undetermined Subphylum/Order”; regardless, we always classified them to the most accurate level possible. The biodiversity data used for comparison to the natural world were retrieved from Zhang (2011b). Figure 1. Arthropod-like Pokémon and the real-world species that inspired them. A. Caterpie. B. Papilio xuthus Linnaeus, 1767. C. Binacle. D. Lepas anatifera Linnaeus, 1758. E. Kabuto. F. Tachypleus gigas (Müller, 1785). G. Anorith. H. Anomalocaris sp. I–J. Kabutops. K. Dimeropyge speyeri Chatterton, 1994. Images A, C, E, G, I, J are official artwork from Pokémon games (extracted from Bulbapedia); images B, D, F extracted from Wikimedia Commons; image H reproduced from Collins (1996); image K reproduced from Chatterton (1994). We found a total of 91 Pokémon species inspired by arthropods, representing 11.3% of all Pokémon creatures. Most of them (19) belongs to Gen III, corresponding to 14.1% of the total in this generation (Fig. 2, Table 1). Figure 2. Proportion of Pokémon inspired by arthropods (red) compared to the other monsters (dark grey) from each generation of the game. 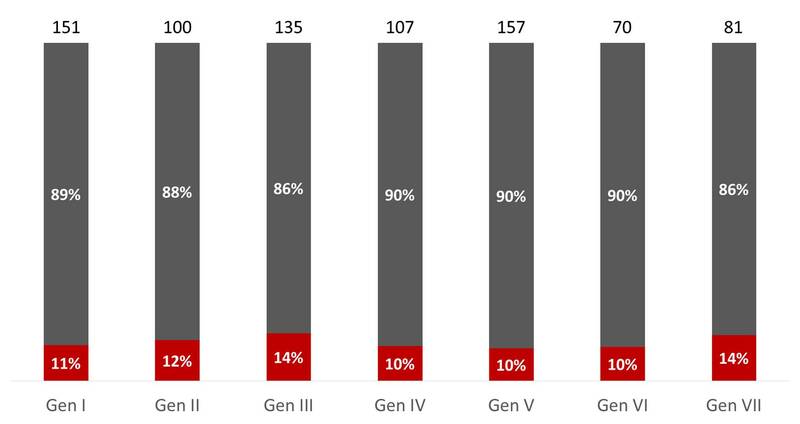 Total number of Pokémon per generation is shown above each bar. Table 1. Pokémon inspired by arthropods, with their Pokédex number, Generation, Type(s) and their pertinent biological classification. Horizontal lines separate the game Generations. Symbols: *Wormadam secondary Type might be Steel, Grass or Ground; †fossil group; “?? ?” indicates an undetermined taxonomic position. Most of the Pokémon species could be classified into the four main living subphyla of Arthropoda: Hexapoda (Figs. 3A–H), Crustacea (Figs. 3I–M), Chelicerata (Figs. 3N–R) and Myriapoda (Figs. 3S–U). The three exceptions were: Kabutops, Anorith and Armaldo (Figs. 3V–X). The former was allocated to the entirely fossil subphylum Trilobitomorpha. The latter two were allocated into another fossil group, with an uncertain position inside Arthropoda (or even an external group, according to some researchers). They belong to the Class Dinocaridida, Order Radiodonta (this ranking is still highly debated, though) and are popularly known as “terror shrimps”. The Arthropoda subphylum that inspired most of the Pokémon species was Hexapoda, with 62 pokémon, followed by Crustacea (12), Chelicerata (11) and Myriapoda (3) (Figs. 4–5). The taxonomical order that inspired most of the arthropod Pokémon was Lepidoptera, represented by 21 species. This can be explained by the huge visual appeal and beauty of butterflies and moths. This explanation can be also applied to the large number of Pokémon inspired by the order Coleoptera (13 species), the beetles, animals with an astounding variation of colors and shape. The third order in diversity is Decapoda (10 species), represented by crabs and shrimps. Figure 3. 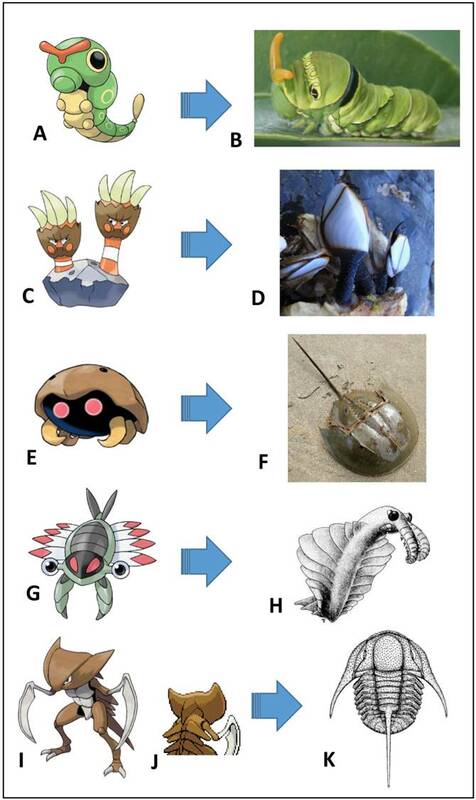 Examples of Pokémon inspired by arthropods, separated according to subphyla. A–H. Hexapoda: A–B. Hymenoptera (Beedrill, Durant); C. Coleoptera (Ledyba); D. Odonata (Yanma); E. Phasmatodea (Leavanny); F. Hemiptera (Surskit); G. Lepidoptera (Vivillon); H. Mantodea (Scyther). I–M. Crustacea: I–L. Decapoda (Dweeble, Clauncher, Krabby, Corphish); M. Pedunculata (Binacle). N–R. Chelicerata: N–O. Araneae (Spinarak, Galvantula); P–Q. Scorpiones (Gligar, Drapion); R. Xiphosura (Kabuto). S–U. Myriapoda: S–T. Chilopoda (Venipede, Scolipede); U. undetermined order (Whirlipede). V–X. extinct taxa: V. Proetida (Kabutops); W–X. Radiodonta (Anorith, Armaldo). The illustrations are official artwork from the games; images were extracted from Bulbapedia. Figure 4. 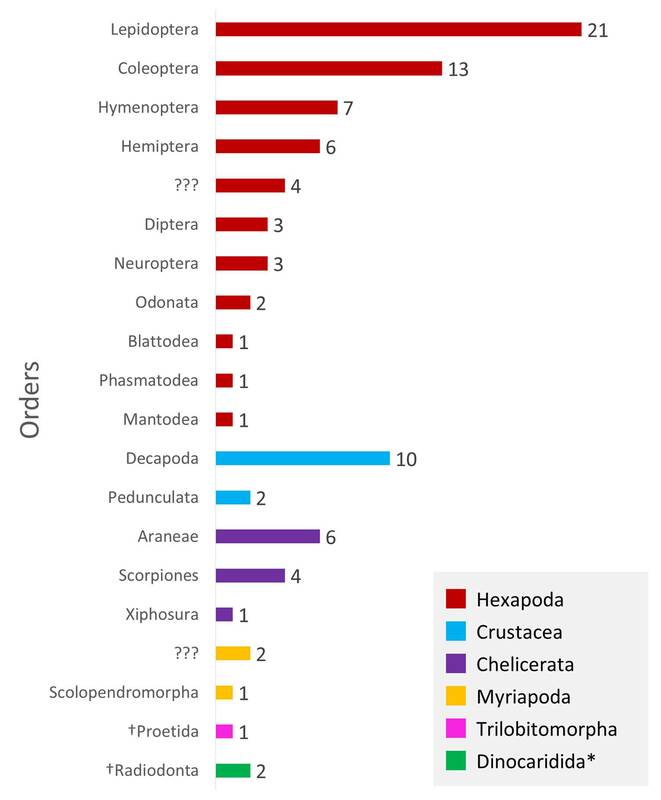 Representativeness (in proportion) of Pokémon species inspired by each Arthropoda subphylum. *Dinocaridida is usually considered a class, with uncertain position in Arthropoda. Figure 5. 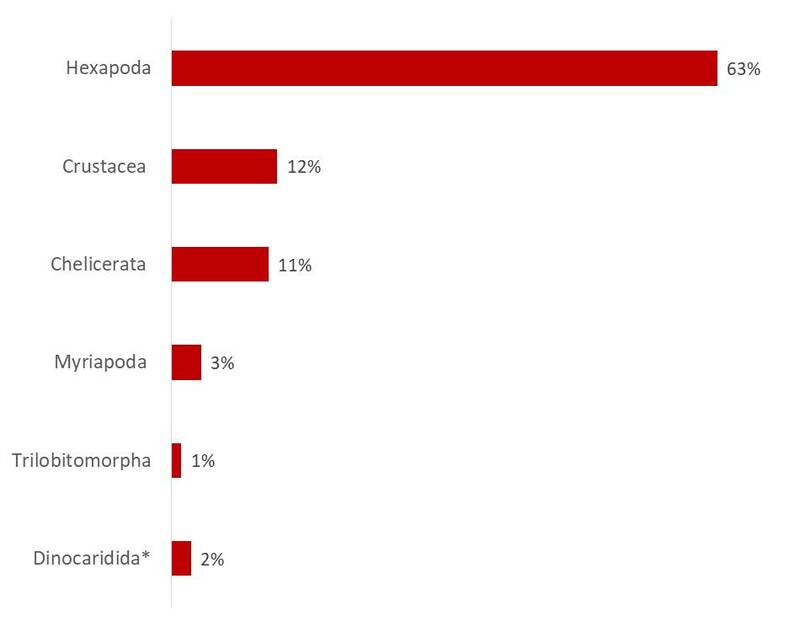 Number of Pokémon species inspired by each order inside each subphylum of Arthropoda. *Dinocaridida is usually considered a class, with uncertain position in Arthropoda. “?? ?” indicates an undetermined order. The large number of Pokémon inspired by Hexapoda is congruent with the high diversity of this group in the natural world (Table 2). The fact that there was more Pokémon inspired in Crustacea (Table 3) than in Chelicerata (Table 4) is at odds with natural diversity, but can be related to the very frequent contact that Japanese people have with aquatic animals, which are one of the country’s main food sources (Ashkenazi & Jacob, 2003). The few specimens of Myriapoda in the game are proportionally congruent with their diversity in nature (Table 5). The comparison between natural and Pokémon diversity shows that the Pokémon world presents higher representativeness of arthropod-like creatures that are more familiar to people or that have a greater visual appeal. The latter is the case of Lepidoptera (Fig. 5), whose diversity in the Pokémon world is much higher than the second place (Coleoptera). However, beetles are the most diverse insect (and overall animal) group in the real world, with approximately 387,000 species, while lepidopterans count “just” with around 157,000 species (Zhang, 2011b). 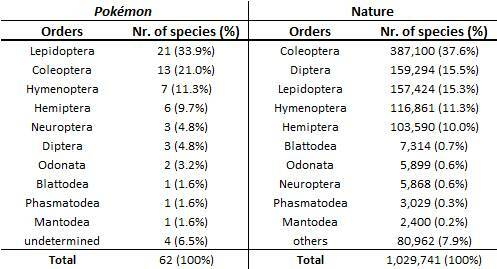 Proportionally, butterflies and moths represent 33.9% of Hexapoda in Pokémon, while in nature this percentage is much closer to that of Coleoptera within Hexapoda (37.6%) rather than the proportion of Lepidoptera (15.3%) (Table 2). Table 2. Comparison between the diversity of Pokémon species inspired by Hexapoda orders and their respective representativeness in the natural world (Zhang, 2011b). Table 3. 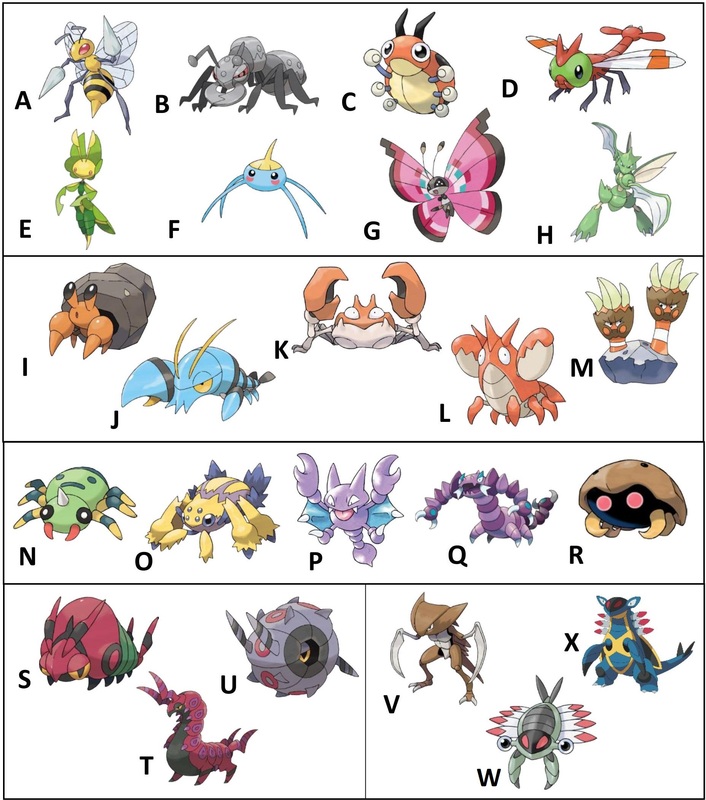 Comparison between the diversity of Pokémon species inspired by Crustacea orders and their respective representativeness in the natural world (Zhang, 2011b). Table 4. Comparison between the diversity of Pokémon species inspired by Chelicerata orders and their respective representativeness in the natural world (Zhang, 2011b). Table 5. Comparison between the diversity of Pokémon species inspired by Myriapoda orders and their respective representativeness in the natural world (Zhang, 2011b). The large number of Pokémon inspired by arthropods indicates that this group, even though not as charismatic as mammalians or birds, still plays an important role in pop culture. The visual appeal and the everyday contact seems to be important aspects that ensure a higher diversity to certain arthropod-like groups in Pokémon. Nevertheless, the Pokémon world still seems to be a good virtual sample of the natural world and this kind of representation can be an interesting source for educational purposes, helping young people to know other type of animals that they do not usually have much contact with, including extinct species. Aubert, M.; Brumm, A.; Ramli, M.; Sutikna, T.; Saptomo, W. E.; Hakim, B.; Morwood, J. M.; van den Bergh, D.G. ; Kinsley, L.; Dossseto, A. (2014) Pleistocene cave art from Sulawesi, Indonesia. Nature 514: 223–227. Andersen, A.N. (1990) The use of ant communities to evaluate change in Australian terrestrial ecosystems, a review and a recipe. Proceedings of the Ecological Society of Australia 16: 347–357. Ashkenazi, M. & Jacob, J. (2003) Food Culture in Japan. Greenwood Press, Westport. Bainbridge, J. (2013) “Gotta catch ‘em all!” Pokémon, cultural practice and object networks. IAFOR Journal of Asian Studies 1(1): 1–15. Brown, K.S. (1997) Diversity, disturbance, and sustainable use of Neotropical forests: insects as indicators for conservation monitoring. Journal of Insect Conservation 1: 25–42. Castanheira, P.S; Prado, A.W. ; Da-Silva, E.R. (2015) Analyzing the 7th art – arthropods in movies and series. International Refereed Research Journal 3(1): 1–15. Chatterton, B.D.E. (1994) Ordovician proetide trilobite Dimeropyge, with a new species from northwestern Canada. Journal of Paleontology 68(3): 541–556. Coelho, J.R. (2000) Insects in Rock and Roll music. American Entomologist 46(3): 186–200. Coelho, J.R. (2004) Insects in Rock and Roll cover art. American Entomologist 50(3): 142–151. Collins, D. (1996) The “evolution” of Anomalocaris and its classification in the arthropod class Dinocarida (nov.) and order Radiodonta (nov.). Journal of Paleontology 70(2): 280–293. Da-Silva, E.R. & Campos T.R.M. (2017) Ants in the Ant-Man movie, with biological notes. Journal of Geek Studies 4(2): 21–30. Ferrier, S.; Powell, N.V.G. ; Richardson, S.K. ; Manion, G.; Overton, M.J.; Allnutt, F.T. ; Cameron, E.S. ; Mantle, K.; Burgess, D.N. ; Faith, P.D. (2004) Mapping more of terrestrial biodiversity for global conservation assessment. Bioscience 54: 1101–1109. Fischer, M. (2000) Species loss after habitat fragmentation. Trends in Ecology & Evolution 15: 396. Kumar, V.; Roy, S; Sahoo, A.K. ; Behera, B.K. ; Sharma, A.P. (2015) Horseshoe crab and its medicinal values. International Journal of Current Microbiology and Applied Sciences 4 (1): 956–964. Mendes, A.B. ; Guimarães, F.V. ; Eirado-Silva, C.B.P. ; Silva, E.P. (2017) The ichthyological diversity of Pokémon. Journal of Geek Studies.4(1): 39–67. Pokémon Company, The. (2017) Pokémon in Figures. Available from: http://www.pokemon. co.jp/corporate/en/data/ (Date of access: 15/ Sep/2017). Salvador, R.B. (2016) The biology of giant war centipedes. Journal of Geek Studies 3(1): 1–11. Tomotani, B.M. (2014) Robins, robins, robins. Journal of Geek Studies 1(1–2): 13–15. Wilson, E.O. (1984) Biophilia. Harvard University Press, Cambridge. Zhang, Z.-Q. (2011a) Animal biodiversity: an introduction to higher-level classification and taxonomic richness. Zootaxa 3148: 7–12. Zhang, Z.-Q. (2011b) Animal biodiversity: an outline of higher-level classification and survey of taxonomic richness. Zootaxa 3703: 1–82. André Prado has a bachelor’s degree in Biological Sciences by UFRJ (Rio de Janeiro) and a master’s degree in Zoology by Museu Nacional (Rio de Janeiro). He is a great enthusiast of Cultural Zoology, studying especially the role of animals in cinema. Thiago Avelar has a licentiate degree in Biological Sciences by UFRJ (Rio de Janeiro) and is currently a high school teacher (Colégio e Curso Miguel Couto, Rio de Janeiro). He was a Fairy Type Elite Four in the extinct Pokémon League Brazil. Biological classification organizes species into groups. From the largest to the smallest group: Domain, Kingdom, Phylum, Class, Order, Family, Genus, Species. Sometimes subcategories can exist inside one of these, like a “Subphylum” or “Subspecies”.